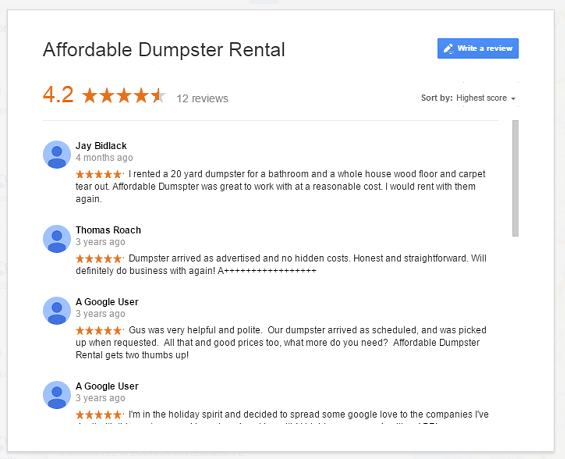 Customer Reviews - Affordable Dumpster Rental of Houston (832) 323-3709, Starting at $199! 9/18/2015 12:51:16 Nelda G. Affordable Dumpster Rental business have the best employee's to work with, they will go the extra mile to help the customers needs. Very impressive. 10/9/2015 10:33:39 Brian W The customer service was excellent! We would definitely recommend Affordable Dumpster Rental. 10/12/2015 11:05:07 Greg F. Thank you for your quick service and good prices. Your great customer service and your wonderful attitude was well appreciated. I would not hesitate to recommend you to friends and would use you again in the future. Thank you so much Greg F.
10/14/2015 15:13:25 Saudys P Greatest service. Fast and comprehensive!! Will definitely use this company for my future needs! 10/14/2015 15:17:15 Sheryl C I recently used Affordable Dumpster for the third time. The company always goes above and beyond to make sure you are completely satisfied as a customer. Their prices are, by far, the best, as well. I called around to 5 different companies this last time, just to be sure, and as before their price was still the best! They were also 3 days sooner than any other company quoted me in getting my dumpster delivered and it was placed exactly as I requested. I will be calling them again for my next dumpster rental and don't even feel the need to check prices again. They are a great company and the one question I had about their service was addressed immediately and couldn't have been handled better. I would definitely recommend them! 10/14/2015 15:34:30 Steve Affordable Dumpster Rental is the best dumpster company I've ever used. Nathan went out of his way to help accommodate all of our needs during a stressful renovation. I recommend these guys. 10/16/2015 14:31:46 John J The staff was very friendly and helpful. I asked for a 20ft dumpster and was given a date and a rough estimate time of when it would be there. The dumpster came on the day that I requested and even came right at the time window they gave me which made it very convenient. The dumpster was picked up two days later without any hassle. They definitely made sure that I was taken care of and accommodated to the best of their abilities. I would use them again when I need a dumpster. 10/17/2015 15:39:52 Chris C. Very easy to deal with. Dumpsters were picked up and dropped off when scheduled. Would use them again. 11/2/2015 20:47:33 Bill Ryan I run a full time estate liquidation business. At least every month or more we need a dumpster. Rebecca is a remarkable asset to me. She really makes things happen- on time and on mission. I could not recommend any of my other sub-contracts higher. 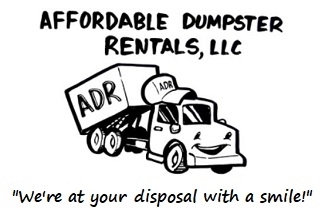 I would suggest you do not deal with other dumpster rental companies as they have many clauses that will surprise you. 11/9/2015 18:46:22 Andy S I have been using affordable dumpster for a few months. Had a family member become a hoarder and needed 6 separate 30 yard dumpsters from them over 2 months. Why I use them. They are family owned and service was great. Their rates were better than corporate and contract details less restrictive than large corporate outfits. I Plan on using them a few more times. 11/11/2015 17:19:05 Randy m Gus explained to rental procedure and I told him how I needed it to be at a certain time because I had contractors driving 4 hours to work on the project. He got the dumpster delivered and picked up on time. He was always available if I had any questions. I will use them again. 11/30/2015 11:14:30 Rick R. Affordable dumpster offers very reasonable prices and excellent service. I rented - 30 yard dumpsters and my request for delivery and pickup was always executed within 24 hours. Nathan was friendly helpful and answered all of my questions before I ever committed to their service. They're online agreements are easy to fill out easy to understand and make the process very quick. Highly recommended. 12/1/2015 15:02:41 Robert C I am very satisfied with my dumpster rental from Affordable. Working with Rebecca to get the information and set up the rental was a pleasure. The dumpster itself was a monster and being able to keep it for 2 weeks really helped me. It made removing a 30 year old fence a manageable project for me. Finally, the final price was exactly as agreed to with no "surprises". I would recommend them to anyone. 12/1/2015 15:23:28 Richard K. I needed a dumpster company for a project recently and not having contacts in the community where the project was located, I simply did an internet search and emailed the potential companies I found. A representative of Affordable Dumpster Rental quickly reached out to me and I was immediately convinced that they were the right company for my job after comparing prices and service times. In the following weeks as I needed additional replacement dumpsters on the site, they responded immediately. I found Affordable Dumpster Rental to live up to their name as being very affordable, but also professional, courteous, timely and easy to work with. I am fortunate to have discovered them.